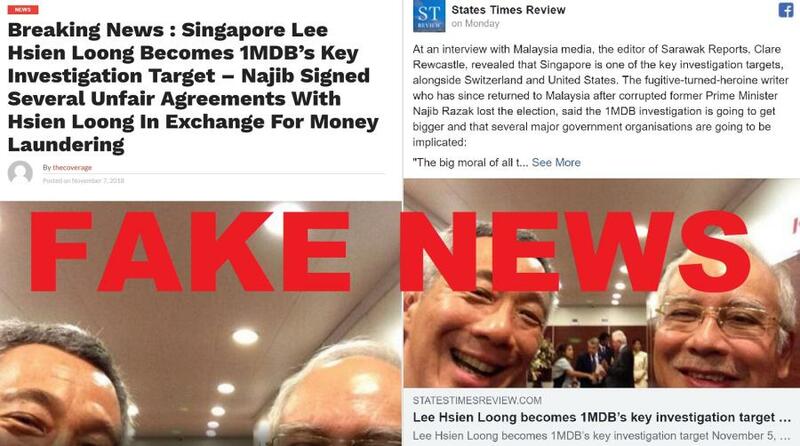 States Times Review & The Coverage Malaysia’s Reports On PM Lee Hsien Loong Being 1MDB Suspect Confirmed As Fake News; Sarawak Report Editor Clarifies – Sinking It In! Alternative news websites The Coverage Malaysia and States Times Review (STR) posted scathing ‘news’ articles alleging that Singapore Prime Minister Lee Hsien Loong and the Singapore Government were now the targets of an unspecified 1MDB international investigation. It further alleges that PM Lee is now a key investigation target in the 1MDB saga. Both news outlets recklessly quoted the Sarawak Report Editor as the source of this latest developments. Despite both website’s less than stellar track record of media credibility, the Singapore High Commission in Malaysia was concerned enough to release the following statement refuting the allegations. Later in the day, the alleged source of these reports (Sarawak Report) pinpointing PM Lee Hsien Loong as a 1MDB investigation target, cleared the air and branded those reports as misleading and erroneous. Investigative news site Sarawak Report confirmed that it did not give any such report and had never written on the subject of PM Lee being a 1MDB investigation target. It categorically disowns any such remarks made in its name. “Misleading article. This article by an anonymously edited website is erroneous. It claims the editor of SR gave an unspecified ‘interview to the Malaysian media’ declaring that ‘Singapore’ is the next target of an unspecified ‘1MDB investigation’. This is yet another instance of fake news wrecking havoc and causing undue confusion in cyberspace both in Singapore and Malaysia. Can nothing be done to these fake news websites who distort information to manipulate their readers into earning them cold hard advertising dollars?